On Monday, November 11, 2019, our solar system’s smallest and innermost planet will transit across the disk of the Sun, as seen from Earth, for the first time since 2016, and here in the Asheville, North Carolina region, with clear skies, the entire 5½ hour event will be visible. This Mercury transit may be thought of as a special type of partial (very partial) eclipse of the Sun by a planet! To observe this rare Mercury transit event and spot the disk of this elusive planet in front of the Sun, you will need 3 things: a clear sky, magnification (binoculars or a telescope), and proper protection for your eyes while using those binoculars or telescope. Remember — it is not safe to look directly at the Sun without proper solar eye protection. Find out where to safely observe the Mercury transit in Asheville, NC. 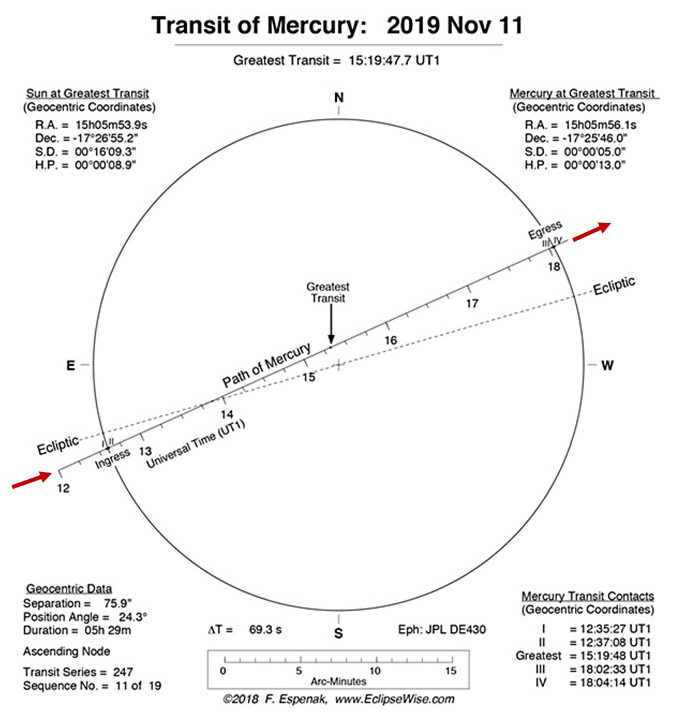 Below is an illustration of the timing (EST) and the path of Mercury as it crosses the Sun’s disk on November 11, 2019. Where else in the world will this transit be observable? Find out on the map below. Of the 8 solar system planets, Mercury has the most highly elliptical orbit with an elliptic eccentricity (departure from circularity) of 0.201 compared to Earth of only 0.017. Mercury, which is orbiting between the Earth and the Sun at this Nov.11th transit, is also near its perihelion position (closest to the Sun in its elliptical orbit) which occurs on Nov. 16th; so that places Mercury farther from Earth – making it appear somewhat smaller – at this Nov. 11, 2019 transit. During this 2019 transit, Mercury will be located some 63 million miles Sunward from Earth. Its small disk will appear only 10 arc seconds across (requiring about 50 magnification to easily observe). That’s only about 1/180th of the Sun’s apparent diameter! During its transit, Mercury will appear as a tiny dot slowly gliding across the face of the Sun. To see the small disk of Mercury, you will need a magnified image with proper solar eye protection. Unlike Venus, whose planetary disk is large enough for the human eye to discern without magnification, Mercury is a much smaller planet and more distant from Earth during a transit. Above image: 2003 Mercury transit from NASA SOHO. Below is an animation of the 2006 Mercury Transit (13 years ago). Notice how round the planet’s disk is compared to the sunspot group on the Sun’s right side. Only the two interior planets (Mercury and Venus) can ever transit across the Sun’s disk, as seen from Earth. Due to Mercury’s speedy orbit around the Sun (only 88 days), its transits, although not common, occur more often than those of Venus. Mercury transits occur only in early May or early November, and only about 13 times per century. The last Mercury transit occurred on May 9, 2016. Venus transits are much rarer, occurring in pairs eight years apart, separated by long gaps of 121.5 years and 105.5 years. Perhaps some of you saw the last Venus transit on June 5, 2012 – the last one until the 22nd century. Mercury passes between the Earth and the Sun from 3 to 4 times each calendar year – an event that astronomers call inferior conjunction. But why then are Mercury transits so rare, and why don’t they occur more often – at each inferior conjunction? 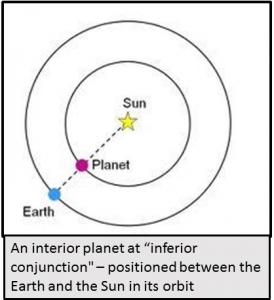 Although all planets generally lie near the Earth-Sun ecliptic plane in their orbits about our Sun, the plane of a planet’s orbit is usually tilted relative to the plane of the Earth’s orbit by an angle called its orbital inclination. As seen from the Sun, the path of the Earth around the sky and the path of another planet around the sky are nearly circular and are tilted relative to each other. 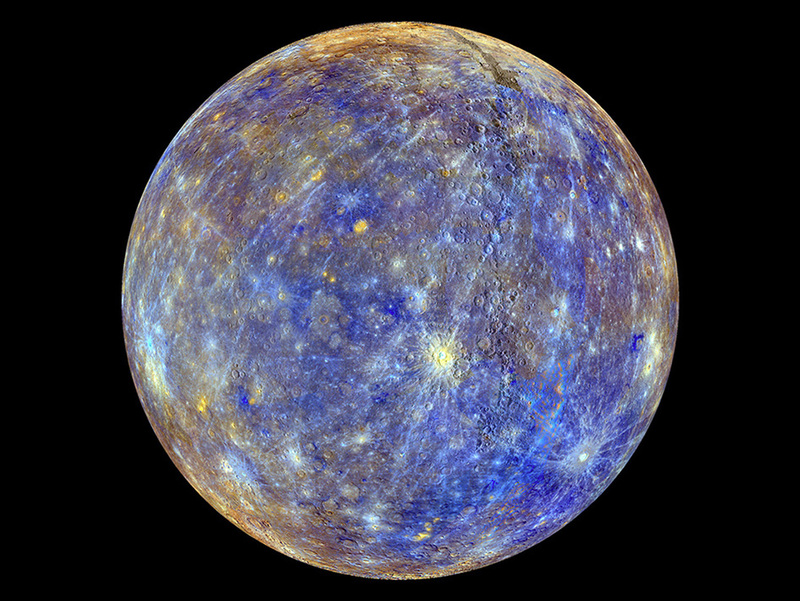 The tilt of the Mercury’s orbit relative to that of the Earth is about 7 degrees – its orbital inclination. No other planet has an orbital inclination this large. During most of its orbit, Mercury is seen above or below the plane of the Earth’s orbit, both from the Earth and the Sun. This is also true for most of Mercury’s inferior conjunctions. So most inferior conjunctions do not result in a transit (see the illustration below). For each planet’s orbit there are two nodes, one where the planet is crossing the Earth-Sun orbital plane from South to North (called the ascending node), and one where the planet is crossing the Earth-Sun orbital plane from North to South (called the descending node). The two nodes are exactly opposite each other as seen from the Sun, so the dates when the Earth is at one node or the other are about half a year apart. In its orbit Earth crosses the 2 node points with Mercury’s orbit in early May and early November each year (the descending node crossing is in May and the ascending node crossing is in November). So no matter how many years separate Mercury transits, when they do occur they are always in early May or early November. These are the only 2 times each year that Earth and Mercury, during their orbits, can both be aligned on the same plane with the Sun. 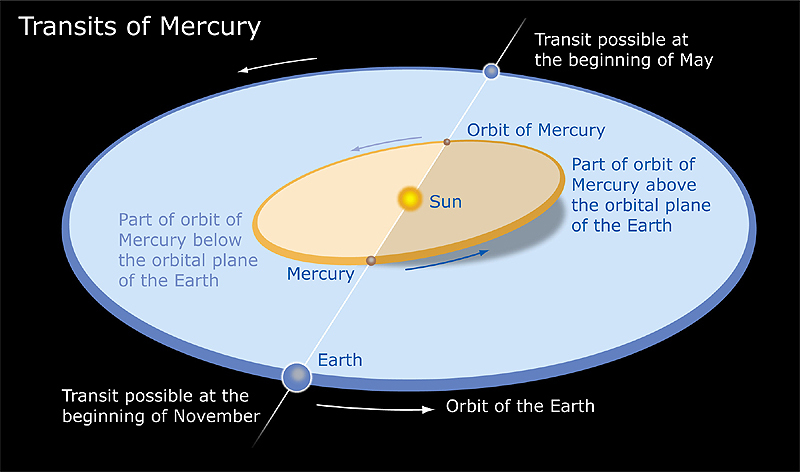 Normally Earth passes one of the two nodes (with Mercury’s orbital plane) when Mercury is ahead of or behind Earth in their respective orbits, and no transit can occur. But if the Earth is very near or crossing a node (in May or November) when Mercury is also between the Earth and Sun (at inferior conjunction), Mercury will appear to pass directly in front of the Sun, or transit the Sun. 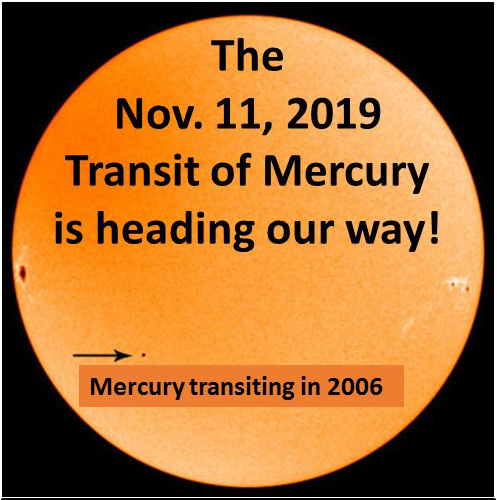 This is exactly what happens on November 11, 2019: Mercury is crossing the Earth’s orbital plane (at the ascending node) very close to the same time as it reaches inferior conjunction with the Earth, that is, positioned between the Earth and the Sun. This special and rare inferior conjunction results in a “transit”. 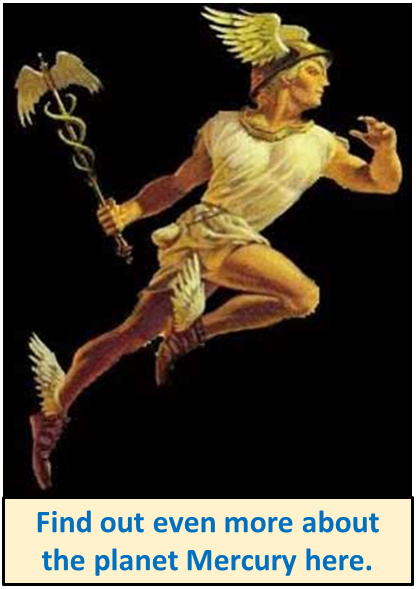 When are the next Mercury Transits? The next two transits of Mercury occur in 2032 and 2039, but neither will be visible in North America. The next Mercury transit visible in the U.S. will not occur until 2049, and, with clear skies, it should be visible in its entirety from Asheville, NC. The above times are approximate for the Asheville, NC area (EST). 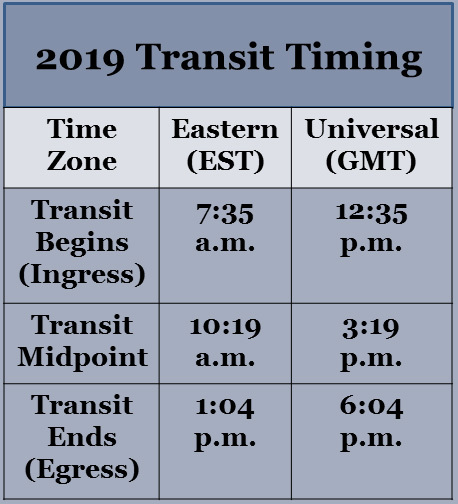 Sunrise occurs at 7:01 a.m. EST on Nov. 11 - just 34 minutes before the transit begins. So the Sun will be rather low - only 5° above the E-SE horizon as the transit begins. "You should really know what the complete natural world of your region is, and know what all its interactions are, and how you are interacting with it yourself. This is just part of the work of becoming who you are, where you are."